The freefall continues. The Pirates went down without much argument last night, losing to the Colorado Rockies by a score of 6-2. A familiar face greeted the Pirates’ offense from the PNC Park mound, as former Pirate Josh Fogg became the most recent below average pitcher to shut down the Bucco bats. I am not going to bother going much deeper into this game, as I have written this same recap many times before. The Pirates have now scored 16 runs in five games since the All-Star break. That includes Monday’s game, when the team put eight runs on the board in a losing effort. As I was on my way to a softball game last night, I listened to the game on the radio. The last thing I heard was Xavier Nady being left stranded at second after a two-out double. 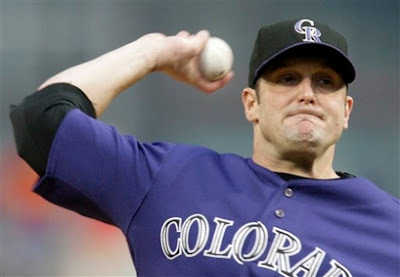 That sent the game into the fourth inning with the Rockies leading 5-2. Hours later, I returned home and went to my computer to check the outcome of the game. I was dismayed to find that I had not missed even a single Pirates’ hit. Grabbing something to eat, I figured I might as well fire up the DVR and quickly watch the ninth inning. It did not take long for our 4-5-6 hitters to strike out on 12 consecutive strikes. At least they managed those three foul balls. It’s like I’ve always said: if you have to go down, you might as well go down without a fight. Ian Snell and Jeff Francis are on the hill as the Pirates and Rockies finish off this series. This game is beginning right now (12:35). Hopefully Snell can end this dismal streak. If there is one guy on this team that can be the stopper, it is Mr. Snell. Cesar Izturis = Shawon Dunston?